Lewis Hamilton is preparing for a race and he is in his usual state of calm. For a man who makes a living racing more than 300 km/h down a track, he is remarkably low-key. Slow, thoughtful, chill. It’s how he manages to get through the work, and the pressure. At just 32-years-old, Hamilton is already a three-time World Champion. He is considered by many to be the best driver on the circuit — and maybe one of the best F1 drivers of all time. Today, he’s at The Factory, the massive purpose-built training and engineering facility in Northamptonshire, England that’s the home of his Formula One team, Mercededes-AMG Petronas Motorsport. Here at this sprawling campus, the art and science of winning is studied and refined — everything from designing the cars to Hamilton’s own mental and physical preparations. It’s been an unusually bumpy season for Hamilton so far, and he’d like to put that all behind him. Tomorrow he leaves for Barcelona, where he’ll concentrate on one thing and one thing only: winning the Spanish Grand Prix. That’s not to say there isn’t more to Hamilton than hyper-focused high performance. Since he burst onto the scene a decade ago, Hamilton has changed the staid world of competitive racing in a number of critical ways. 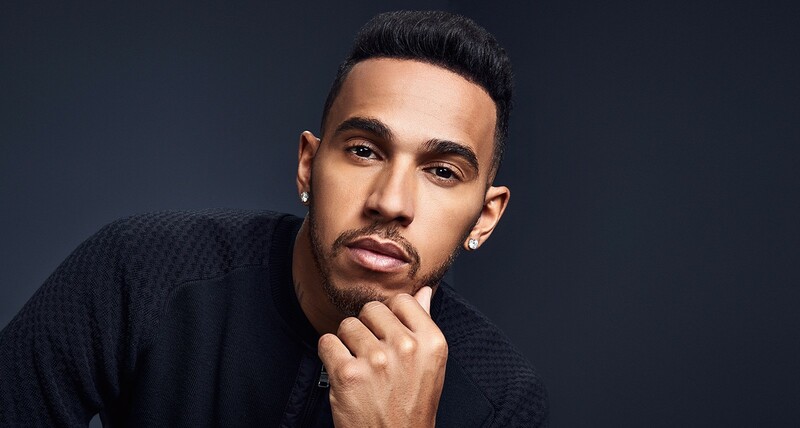 He was the first black driver to race in Formula One, and, in 2008, became the youngest driver in history to win a World Championship. His career has been one defined almost exclusively by successes — and he knows how to enjoy it. He frequently parties with celebrities, owns his own bright red private jet, and is currently the richest athlete in the United Kingdom. Considering all of that, his characteristic down-to-earth chillness is all the more impressive. So what does Lewis Hamilton make of his life right now? We spoke to him at the end of a long day of preparation and found what makes him go. Let’s start at the beginning. How did you get into racing in the first place? I started racing when I was eight, and I’m 32 now, so a long, long time ago. I would spend the weekends — my parents were divorced when I was two, and I’d spend my weekends with my dad — racing radio control cars, and when I got to seven my dad bought me a go-cart that he’d bought from a newspaper second-hand, and we just started going to lots of go-cart tracks. Then we entered a few races for fun. I won my first six races, and it kinda just continued on from there. We enjoyed it. My dad is super competitive like I am. Cars were something I loved and then I always wanted to be a full-on driver. I love the speed. I love the exhilaration. I love that I can do it. It seems so at home in the car. Who were some of your racing heroes back then? I don’t feel like I had many heroes, but the only one in a racing sense was Ayrton Senna. I liked his driving style. I loved his no-fear approach, his relentless pursuit of perfection as a driver. I wanted to be a driver like him. The career you’ve had since makes it look easy. But what were some of the obstacles along the way? We were the only black family that’s ever been in the sport. That in itself was massive… being in a white-dominated sport was not easy. Also the fact that it’s very expensive. My dad had four jobs at once just to keep me go-carting in the first few years and we mortgaged the house and just worked to the bone really to keep a roof over our heads while still racing. There were also the pressures of racing itself, but that’s the same as in any sport. As a kid, I’d spend every day racing and practicing, so I missed a lot of school, which was difficult to catch up. Social life as a kid… I missed out on a lot of my childhood. Was it all worth it for you? Yeah, absolutely. It was a long journey, a long way. So with all that pressure, and the punishment of racing, what gets you up in the morning, putting on the helmet and getting out there? Things that keep me going are the thought in the back of my mind of just how hard my family worked to give me the opportunity, my fans, the sheer will and the love of the driving. The reason that I connected with Ayrton is because I’m a perfectionist, and that constant drive for perfection — always wanting to better yourself physically, mentally, and in the car with your capabilities, honing your skills — is something that I love being challenged with. So let’s talk about that a bit. What’s your training regimen like? It varies and depends where I come from. This week, for example, I left for the team’s factory at 8 a.m. I went for a run at 6, and then tonight will be at the gym to do core and abs for an hour. And then the past week I’ve been doing more gym time everyday and running. Then tomorrow I’ll be working all day. And Thursday in a race week you don’t do a lot of training, it’s more about having as much energy as possible for the race. What about before you get into the car? What do you do to psyche yourself up? I don’t psyche myself up. No, I don’t need to. It’s not like that for me. For me it’s like being as chilled as possible so I just listen to some music. Anything and everything. Sometimes I just put my phone on random and oftentimes I’m just listening to new stuff. The albums I’m listening to right now are Kendrick and a group called They. The 1975 as well I listen to quite a bit. You also record your own music. What do you get out of music that you don’t get out of racing? I’ve been doing music since I was 13, so it’s just a part of my life. My dad used to be in a band. It’s something I’ve always loved doing. I love being creative. I love the freedom you have in making music. I love listening to people’s creations everyday and working with people to create something. You talked about wanting to be super chill before you get into the car. How do you unwind? I’m generally a really chill person anyways so it’s not like I really need to do anything. Unwinding to me after the race is when I get home with my dogs, take my dogs for a walk, watch a movie, you know, have a nice quiet night in. Put some music on. You know, I live in Monaco so I have a view of the sea so I look at the stars, all that kind of crap. Monaco is a pretty flashy city. And from even just looking at your Instagram, you don’t shy away from flash. You’re into fashion. How do you define that part of your life? My style is very… how would I say it? It’s very urban chic. I mix a lot of street style with high-end and upstreet brands. So yes, I am very much into fashion. Having a fashion brand like HUGO BOSS working with our team as one of our main sponsors is fantastic. I can always find something to wear from them for team events, whatever style I’m looking for. You’re also not shy about going to parties and hanging out with musicians, athletes, other celebrities — which is rare for F1 drivers. Is that something people are critical of? Do you care? I mean, people are critical of every move and everything you do, everything you say. If it’s not textbook this-is-how-a-racing- driver-does it, yeah they’ve complained about it. I think just about every single thing I’ve done has been complained about. But I really couldn’t care less. You know, I just focus on doing me and doing my job. All you can do is focus on getting yourself prepared. Just because you have multiple interests outside of racing doesn’t mean that you’re not focussed. In the last three years I’ve won two world championships. I’m going for my fourth this year. Tell me about that. You’ve had a lot of success in the last 10 years. Looking back, what are some of the biggest things that you’ve learned in that time? Not dwelling on things, for example. You’re going to have to let go of when you fail, when you have difficult weekends. Take the positives from a negative situation and move forward to progress and grow. Another part of it is not caring what other people think. Know who you are, know your values, and if someone has something to say about it, that’s their problem, not yours. Just focus on your family values and your own abilities and your job and the goal and that’s what I do. And enjoy life. Enjoy every moment as if it’s your last, because you never know when it’s going to be your last day. And on a similar note, you’ve become a role model for lots of young F1 fans. How do you feel about that? What do you hope that kids will learn from you? Being a role model is a difficult thing to grasp, because in one sense you have to live your own life — you have to make your own mistakes — but you’re constantly reminded that you do have people looking up to you on how you live your life, how you carry yourself. I try to be encouraging and know that I’m a human and I go through similar thoughts that any other human will go to, similar insecurities, similar doubts and fears. Like other people I find ways through. But it’s definitely very surreal when kids come up to me and they’re like “One day I want to be a racing driver just like you.” I think that’s very cool, and that feels very much like we as a family broke down barriers — much like the Williams sisters, a bit like Tiger did. When I started racing, like I said, for my first 15 years we never saw one other black family at a race. We were the only one. So now kids of all different ethnicities are coming over to me, saying “I wanna be a racing driver.” Not just black people, but Asians, people from all different walks of life. And I think — I like to think — that we helped inspire that. That’s something I’m proud of what we’ve achieved as a family. You mentioned briefly the idea of fear, and you said you were inspired by Senna’s fearlessness, which is clearly true on the track. But what does scare you, if anything? Maybe it’s a bit crazy, but I don’t really have any fears when I’m driving. I guess in life, if I have a fear — which I really don’t; I think fear is a state of mind — if anything it’s allowing myself not to excel. I was just thinking today that no one’s going to do it for you. You’ve got to do it yourself. No one’s going to get you up and take you to the gym and work out. No one’s going to take you down to the race and get you to make sacrifices on the fly. You’ve got to do what you’ve got to do. Only you’ve got to get out of the way of yourself. So if there is any fear it’s that I ever get in the way of myself. And fortunately I’ve got great people around me who make sure that I don’t do that. You’re only 32, and you’ve accomplished a lot. What’s next for you? I feel like I’m just starting life! I feel like I’m only just beginning to live. I think there’s so much more up ahead that’s still very much unknown. But I’m definitely in a very positive space in my life. It’s strange that after so many years of racing I still have this drive, but I woke up this year with this crazy de- sire to win this championship — that’s really my sole focus right now. But it’s also understanding my surroundings and what I will be doing beyond racing. Those two things come hand-in-hand at the moment, and it’s those two things that I’m super focussed on. Because normally when sportsmen and athletes stop racing, they become commentators and stuff like that. I’d like to have some other challenges. That’s what I’m trying to discover.